Beginners Tutorial: How to Pick Up the Best WordPress Plugin for your Website? Don’t be stressed, we are here to help you. In this post, we will guide you on how to choose the best WordPress plugin. WordPress is the most powerful CMS that is emerging in today’s world. Many website developers started using WordPress to furnish a unique website. Though with WordPress you can create a unique website, to add additional functionalities to your website plugins are required. In a wide range, there are nearly 56,000 plugins available in the repository. Around these plugins, choosing the right plugin for your website is really a tedious task. Because you should know how to choose the plugin, that works on your website. Don’t ever rely on thinking that one plugin will serve all your needs. A total number of plugins doesn’t matter. You can install and activate a maximum of 10 to 15 without affecting the loading speed of your website. While searching for a plugin, it is always good to check in the official WordPress plugin repository, www.WordPress.org/plugins. Here you will find the validated plugins. You will find plugins in this repository. If you are purchasing the plugins from any third party, make sure it is secure and safe. But before choosing any plugin, make a note of your requirements. Once you made a list and understood the features, you can easily pick up the plugin based on your website requirements. Once you make a note of functionalities that are required for you, then pick up the plugins based on it. With the same functionality, you will find dozens of plugins. In that situation, you will be really worried which plugin to choose. List all the plugins that suit your functionality and follow the checklist to pick the best among them. Here’s a complete checklist of how to choose the best WordPress plugin. First and foremost thing before installing a plugin is that read its description. By reading the entire description, you will be able to analyze whether this plugin is suitable for your requirement or not. If it satisfies few of your functionalities, then go ahead and check out its other options of choosing it. A higher number of active installs, states that it is more trusted by the WordPress community. So higher the number of active installs, a better choice to choose the plugin. In WordPress.org repository you can easily find the number of active installs displayed. For safety measures, it is not recommended to pick a plugin which is less than 1000 active installs. But one point to be noted is, newer plugins may sound good but will have less active installs, just check out other features of the plugin and make use of it. Another point to be noted is the last update of the plugin. It is important because we can judge how active the author is working with their updated functionality. Because once you started using the plugin, and if they don’t come up with any extendable functionality, then its burden for you to choose another plugin. So initially it is better to check with their updates and their active participation. This information is also displayed the WordPress repository. Next important checklist is that the plugin rating. Just by looking at the ratings, you can easily analyze the standard of the plugin. You can find this rating on the plugin page. The highest plugin star is five and the lowest plugin star is one. It is easy to identify just by the stars indicated for the plugin by users. The star is completely given from the user’s side. But if you really need the plugin for your purpose, then don’t miss it right way just by the ratings. Because one point is that not every user will rate the plugin even though they might be using it. So if you have any queries regarding the plugin, just drop a mail to the author, they will come up with the solution telling you will this plugin be suitable for you or not. Have a rating comparison, like check the rating with the number of persons. A rating of 4 by 2000 people is a better indication rather than a rating of 5 by 10 people. It is always a good sign to read the users review before installing a plugin. If a user rates the plugin, then the user will get an option of writing the review. Just by clicking on the star link, you will be able to read the reviews. It is must to read both the positives and negatives of the plugin. Just by knowing its negative side, you have an option of thinking whether this plugin will be suitable for your needs or you can fix it since its a minor issue. The plugin must be supported by the author. You will be able to view the support section in the plugin page, or by clicking the support icon. It is to check how active the author is resolving the issue and replying to the user’s queries. A good one to check so far how many numbers of threads are resolved. It just shows the authors capability of resolving it, and the issue resolved should be within two months. 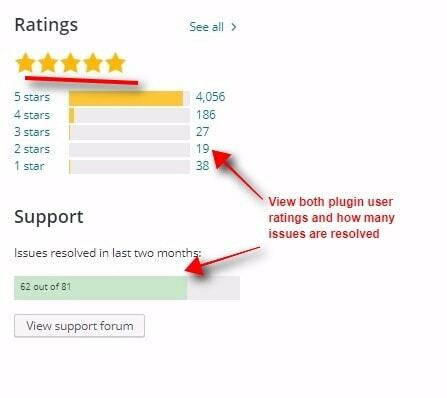 If there are many issues unresolved, and no proper response from the author, then consider choosing another plugin because you might not get any ample support if you face an error. Make sure that the plugin is compatible with WordPress recent updates. Just by its compatibility and responsiveness, you will able to make use of the plugin. In the plugin page, clicking on the description tab, you will able to see the plugin compatibility. You can check out to know how far with the updated version will this plugin work. It is also important to check the current version of your WordPress in order to avoid worst-case scenarios before installing the plugin. Even with the themes and other plugins if you have already installed. Take time to read the testimonials of the plugin. It is really important for you while installing and configuring the plugin. You will find an option as FQAs below the description. Spend your time reading this because it will clarify most of your doubts. Some plugin may or may not have this section. But reading this section, you will exactly know how to install and configure this plugin. If you encounter any error also, this section will help you to rectify it. Each and every plugin comes with different documentation and instructions on implementing it. Sometimes it will be confusing if you keep on reading the full description of the plugin. In that case, if you check the screenshots of the plugin, you will see the exact view of the plugin and you know how the plugin will look like in your website if you install it. It gives you an exact layout of your front-end and back-end. With that, you can decide whether this plugin will fit your current WordPress. A badly coded WordPress plugin may slow down your website and leads your website to some dangerous situation. In order to avoid that, first, you have to test the plugin, before making it live. You can create a dummy website or install the plugin into localhost and test for it, or there are other maintenance plugins, that gives the admin an option to turn off the visibility of the pages, and test area to check for the plugins. You can make use of it. Initially, before installing the plugin, take a speed test of your website, with any of the popular speed test websites like Pingdom or Google speed. Make a note of your website speed. Now install and configure the plugin on your website, and then again check the speed of your website. By adding this plugin, if your website is having the same speed or an increase in speed, then there is nothing to worry. You can happily start using it plugin. But if it reduces the speed, then its a drawback and you have started searching for another plugin. Considering all the points in mind, choose a wise plugin that improves the performance and speed of your website. 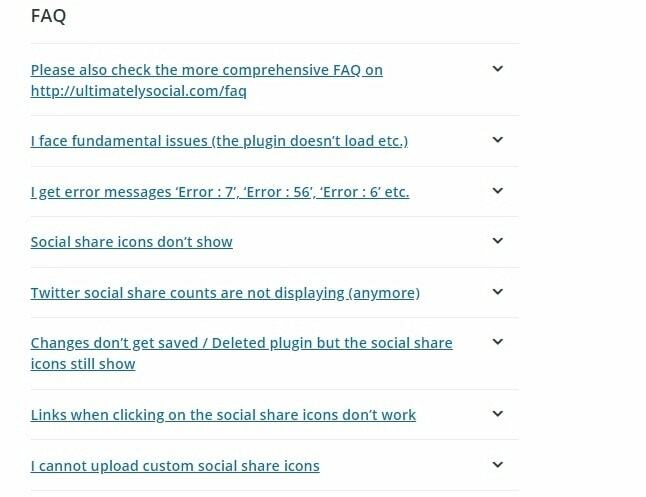 Not a big task of choosing the right plugin, once you are used to this checklist. Hope you got an idea on choosing the best WordPress plugin for your website. If you have any queries or comments, please feel free to comment to us. You can subscribe to us at Facebook and Twitter.